There’s supposed to be this whole mystique surrounding “proper” pasta: how to cook it, which shape with what sauce, how to eat it, all that. And if you’re not born to it, you’ll never really understand it. Well, maybe not, but with a little effort you can get a whole lot closer to authenticity. Maureen Fant, a writer and scholar who has lived in Rome since 1979, has a new book out with her collaborator Oretta Zanini de Vita, making their Encyclopedia of Pasta a tad more kitchen-friendly. Sauces and Shapes: Pasta the Italian Way is a curious blend of the constrained and the relaxed … just like Italy. One of the things they’re relaxed about is shapes for sauces, which came as a bit of a surprise. One of the things they’re not relaxed about is overcooked pasta, which did not. There was so much else we could have talked about, and the book is a one of those cookbooks that is as much a good read as a manual of instruction. As for my beloved cacio e pepe, fashionable or not, I am greatly encouraged by the the news that “[t]his is not a dish to make for a crowd … The smaller the quantity, the better the result.” That’s all the encouragement I need. 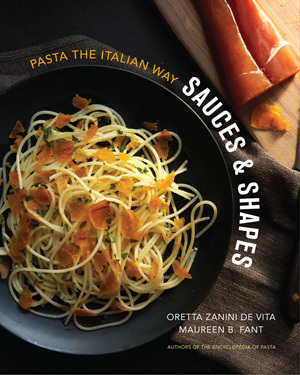 Sauces and Shapes: Pasta the Italian Way is available from Amazon and elsewhere. I’m not too sure what to make of the whole mathematical pasta trope. It smacks to me of an answer in search of a question. Maureen Fant recently gave a great little interview on spaghetti carbonara that tries to set the record straight on this canonical dish. Cover photo by Stijn Nieuwendijk. If you listened to the podcast and made it this far, you know I promised you a special treat. Here it is. Little Richard sings On Top of Spaghetti. We barely talked about spaghetti alla carbonara for the podcast, and quite by coincidence I recently came across a new theory about the origins of the dish. I have to say, it sounds very plausible to me. Hi Jeremy. Love the music!